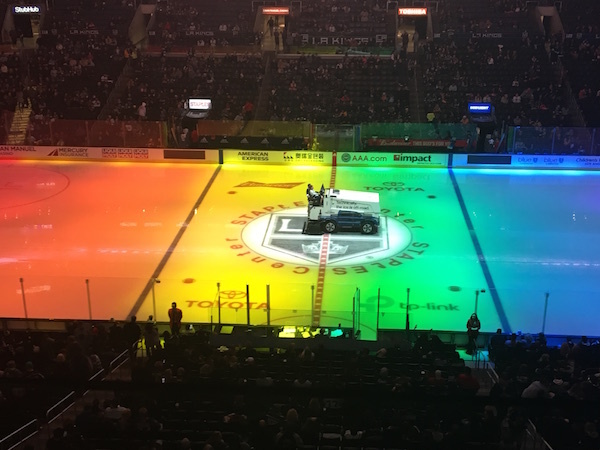 “I came here to support hockey in the LGBT community,” said Jamison Lewis, 30, “and to watch my favorite team play.” Lewis, an LA native and ice hockey player himself was enthusiastic about the Kings’ second annual Pride Night at Staples Center. He attended with his boyfriend Michael Williams. Mike Altieri, senior vice president of communications and team operations for the Kings would have been glad to know his team’s LGBT outreach efforts affected such loyal fans so positively. If the mood at Staples Center was any indication, hockey fans of all persuasions seemed to concur.